TENNESSEE: GOP US House Rep. Marsha Blackburn Launches "Politically Incorrect" Bid For Senate [VIDEO] - Joe.My.God. Republican U.S. Rep. Marsha Blackburn is launching her bid for the U.S. Senate on the heels of Gov. Bill Haslam’s decision to sit out the race to succeed retiring Sen. Bob Corker. Blackburn described herself in her campaign announcement Thursday as a “hard-core, card-carrying Tennessee conservative” and decried the Republican majority in the Senate for failing to repeal former President Barack Obama’s health care law. Blackburn was first elected the Congress in 2002 and has been a regular guest on political talk shows on TV. She made a name for herself as a state lawmaker for opposing a fellow Republican governor’s bid to introduce a state income tax. Blackburn said she supports President Donald Trump’s proposal to build a wall on the border with Mexico. 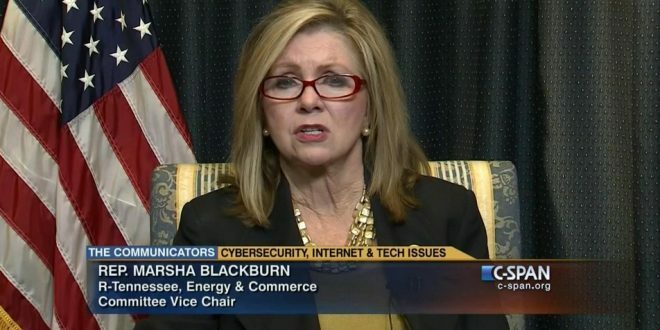 Blackburn is a loony tune creationist and has been one of the loudest climate change deniers in the US House. And as you’ll see from her campaign clip below, she’s rather fond of filming herself through cheesecloth.